The RIPE Atlas credit system allows us to recognise participants' contributions to the system. 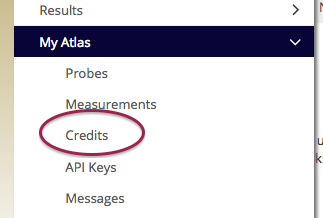 RIPE Atlas probe hosts earn credits for the time their probes remain connected, and for the number of measurement results they generate, and in return can spend these credits to request services (user-defined measurements, called UDMs) from it. It is meant to serve as a means of measuring the level of contribution to, and consumption of, resources in the RIPE Atlas system. Everything you need to know about your credits including history, visualisations, and a form to transfer your credits can be found at your "Credits" page. Simply find the link to "Credits" under your username in the navigation bar. You can earn credits by hosting a RIPE Atlas probe, being a RIPE Atlas sponsor, being a RIPE NCC member or the member of another RIR, being an LIR (member of RIPE NCC) or through a transfer. You can spend your credits by scheduling user-defined measurements, or via a transfer. Every probe that you host earns you credits that can be spent on user-defined measurements. Credits are earned as long as the probe is connected to the RIPE Atlas infrastructure (shown as "connected"). Accounts are credited once per day. A host (and sponsor, see below) receives 15 credits for each minute that their probe is connected to our network, so assuming that your probe is connected continuously, you should earn roughly 21,600 credits every 24 hours, which you can spend conducting user-defined measurements. If you host more than one probe, each connected probe will earn credits at this rate. If you are not already a host, click here to learn more about hosting a RIPE Atlas probe. Organisations hosting a RIPE Atlas anchor earn ten times as many credits as regular probe hosts. Click here to learn more about hosting a RIPE Atlas anchor. Individuals and organisations can choose to sponsor blocks of probes, which gives you the collective benefit of all the probes you sponsor. If you sponsor 16 probes, you receive credits for all 16 probes in addition to the credits the probe hosts accumulate themselves. Organisations and individuals who sponsor probes are also entitled to credits. Click here to learn more about sponsoring RIPE Atlas. In addition to the methods for earning credits mentioned above, anyone who creates measurement results will also receive additional credits, at the rate of one credit per measurement result. This is our way of giving a little extra reward to those who contribute the most to RIPE Atlas, and especially benefits the hosts of probes and anchors that are heavily used. Users can also transfer credits, and receive transferred credits from other RIPE Atlas users. To transfer credits to another user, select the 'Transfer' tab on your credits page and fill out the form. Note that the receiving user must be registered in the RIPE Atlas system. You can also share your credits with other RIPE Atlas users on a regular basis by setting up a standing order using the “Standing Order” tab on your credits page. You can set the amount of credits you want to share, the threshold above which you will start automatically sharing your credits, and one or more recipients who will receive your credits (note that credits will be evenly distributed among the recipients, and that they must be registered RIPE Atlas users). If you don’t want to set limits on the number of credits you share, you can also allow other RIPE Atlas users to use your credits directly for their own measurements. Select the “Share Access” tab on your credits page and enter the RIPE Atlas users you want to give access to. Users who have been given access to others’ credits will be able to choose whose account to charge when they create a new measurement from a drop-down menu. This option can also be set via the measurement API. A running measurement can be stopped by both you and the person with access to your credits. If you decide to stop giving someone else access to your credits, any measurements they have running will start using their own credits instead. Each user-defined measurement (UDM) requires resources from the network of involved probes, as well as from the RIPE Atlas infrastructure itself. The credit system is therefore designed to make it more "expensive" (in terms of credit consumption) to run measurements that are more resource intensive. Because of this, when you schedule a measurement, the system calculates how much each result should cost (this is the "unit cost"). Each time a result is delivered to you, the appropriate amount is withdrawn from your credit balance. The more results are delivered, the more this costs you. The scaling is linear, so, for example, five results will cost five times more credits. Since the cost of a measurement over a certain time period only depends on the number of results delivered, but not on the frequency or number of probes assigned to the measurement, it costs the same to run a measurement, for example, from one probe every minute or from ten probes every ten minutes or from 100 probes every 100 minutes. (All of these measurements will yield an average of one result per minute). For efficiency reasons, you are not charged immediately for each delivered result. Instead, we charge in batches every four to six hours for all results delivered in that period. The cost for the individual result depends on what type of measurement you conduct, and what options and flags were specified. The following sections describe the current settings. One-off measurement result is twice as expensive. If you schedule a traceroute using five probes to run twice per hour for a period of two days (48 hours), you would expect 480 result lines. (5 probes x 2 measurements/hour x 48 hours = 480) With 480 result lines, the cost for this traceroute measurement would be 14,400 credits (30 credits/result x 480 results = 14,400). We periodically calculate your credit consumption rate (number of credits used per time unit). This calculation includes the debits as well as the credits. Based on the consumption rate, we make an approximation about the time remaining before your account balance reaches zero credits. If the time remaining is projected to be less than five days, we will send you a warning email explaining the situation. If you're already in debt, we will stop your most costly measurement, and notify you by email. If we do have to stop one of your measurements, you will still be able to access the measurement's results up until you ran out of credits. Once you have earned sufficient credits again, you'll have to recreate the measurement.